While Malcolm Turnbull was telling the UN how wonderful our offshore gulags are, 49% of Australians wanted to ban Muslim immigration. John Passant looks Australia's structural racism. 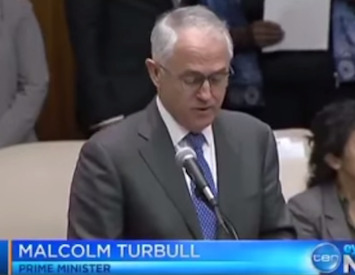 THERE, in all his glorious splendour, was Malcolm Turnbull, telling a near empty room at the United Nations how wonderful Australia’s offshore detention centres are. Such is the depravity of politics, globally, that Turnbull defended Australia’s concentration camps at the same time as he was making a bid for Australia to win a 2018 seat on the UN Human Rights Commission. Meanwhile – such is the logic of top-down institutionalised racism in Australia – that at the same time, an Essential report showed 49% of 1000 online respondents wanted to ban Muslim immigration. The two issues are linked by settler colonialism, xenophobia and the racism that our "1%" force feed us. Australia is a settler colonial state. It was – and is – built on the extermination of Indigenous Australians, their culture and economy by the settlers and the society they bought and built. The Indigenocide is ongoing. So too is the dehumanisation and racism the ruling class used and abuses to justify the destruction of those already here. This dehumanisation and racism are part of the process of "superiorisation" of white society and all who belong to it — despite the fundamental class differences between white workers and white employers. The logic of invasion imbues a fear in the settlers and their descendants and "inheritors" not only of the internal Indigenous "other" but the external "other" as well. That external other can be other expansionist states such as the French, the Russians, the Germans, Japanese — or internal white others like Catholics and non-whites like the Chinese. Later on, the yellow peril becomes the red peril. White "superiority" has helped cement Australian workers to the system of their bosses and thus to their own exploitation. One of the first acts of the newly federated Commonwealth in 1901 was to legislate the White Australia policy. It was official government policy for over 60 years. Not only during that time did it exclude non-white immigrants; it returned Pacific Islanders stolen for their slave labour to nearby countries. It refused to accept Aboriginal soldiers attempting to return from fighting for the Empire against the Boers in South Africa. And it rejected Jewish refugees fleeing the Nazis. "It will no doubt be appreciated also that as we have no real racial problem, we are not desirous of importing one by encouraging any scheme of large-scale foreign migration …"
The same sentiment lives today, although now the target of exclusion is not Jews but Muslims. The Holt Liberal Government began dismantling White Australia and the Whitlam Government legislated it, on paper, out of existence. However, the logic of settler colonialism, of white "supremacy" and fear of the other remains, driven by both the structure of invasion and a ruling class who want to unite workers with them, using the false narrative of the "enemy other". With her shifting racial targets, Pauline Hanson captures this. Twenty years ago, she told us we were ‘in danger of being swamped by Asians’. Today, we are "in danger of being swamped by Muslims". In this, Hanson reflects not logic but systemic fear. That fear becomes more pronounced during times of economic uncertainty. With increasing inequality and poverty, with increasing job precariousness, with many small businesses under threat, especially in the rural and regional areas of the mining states, her message resonates with some workers and small business owners. Given this history of settler colonialism in Australia and the end of the mining boom, expressed by the election of four One Nation senators, it should come as no surprise that a recent Essential poll found that 49% of the more than 1,000 online respondents agreed that Muslim immigration should be banned. It was a surprise to many on the left. But after 9/11 and the War on Terror; the death of millions in Iraq, Afghanistan and elsewhere at the hands of the West’s actions; the response of Islamic terrorists to Western terrorism; the incessant propaganda of our rulers to justify their terrorism, and the demonisation and locking up of asylum seekers (often fleeing wars we created), why should it surprise us that many in the settler colonial state of Australia support openly racist immigration policies? According to the same Essential poll, 60% of Coalition voters supported the ban, as did 40% of Labor voters. So, too, did 34% of Greens voters. Settler colonialism is a structure, not an event. Now, we can quibble a bit with the figures. It was an online poll. People self-identified as particular voters. Only 1,000 of the 8,000 invited to respond did so. We cannot quibble with the fact that a significant numbers of Australians, including so called progressive voters, support racist policies. In this, they reflect an essence of Australian settler colonialism. We live in a society where the crimson thread of racism runs deep. Demonisation of the other is not confined to skin colour or Indigeneity. It is also directed against so called "dole bludgers", single mums and, indeed, all those on social security or receiving government payments (other than business itself). Who can forget the front page of the Daily Telegraph railing against young dole bludgers, based on a story that was made up? Because those on the dole, those on pensions, those on disability payments, those on carer payments are not selling their labour just to survive, they are not seen as a real part of capitalist society. We are defined by the sale of our labour power, or non-sale as the case may be. The fault, however, lies not in ourselves but in the system’s stars. Capitalism causes unemployment. About 800,000 want work and many more want to work longer hours. There are only a bit over 100,000 jobs available. Forcing people to live on $264 a week, about $140 below the poverty line for a single person, is part of a deliberate strategy to drive down real wages and put more money in the hands of the profiteers. Age pensioners, too, are under attack in terms of payment levels, age and other accessibility rules and the mandated investment of part of our wages to fund our own retirement. According to the OECD 36% of Australian pensioners live below the poverty line. Government changes will increase that figure and force 70 year olds to work, work and work, if they can. Most cannot. Attacking Muslims, like attacking the unemployed, or pensioners, or Aborigines, or unions, is part of a wider ruling class offensive to divide and conquer. To defend our jobs, our wages, our living standards, we workers and our unions have to understand racism is one weapon in the armoury of the ruling class. Don’t let it pierce our hearts. In the UK, left wing Labour leader Jeremy Corbyn has been winning votes from populist right wing parties by explaining that the enemy of ordinary working people is not other people but the capitalist class and its politicians. By offering hope, by offering a vision of a better society, we can build paid jobs to address the issues challenging society — and we can improve the lives of all working people. All Turnbull offers here, is the demonising of refugees, Indigenous Australians, unions and, nudge, nudge wink, wink, gay people. Ultimately, we can only overcome this this xenophobia, homophobia and racism by overcoming the system that spawns it. Till then, and as part of that process, we must try to fight against the various manifestations of a sick system. We must patiently explain where these evils come from, from a class based society and a system built on the theft of Aboriginal land. Don’t let racism pierce our hearts.